You might have thought dental implants are just for individual teeth, but implants actually offer a variety of functions and advantages! 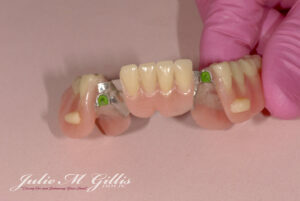 In our office, we often use dental implants to stabilize partial dentures. Dental implants are small, medical-grade devices that are placed in the bone of the jaw and they can be used to support dentures and partial dentures. For this application, specialized attachments are placed on the implant which precisely fit into a corresponding part on a custom partial denture. So, instead of having a partial denture that can flop up and down on the gums, the new partial snaps onto the implant(s) and feels much more secure. Patients who receive implant-retained partial dentures describe remarkable improvements in their ability to chew, the esthetics of their smile, and their personal confidence. Best of all, patients find the procedure to be comfortable. Dental implant-retained precision partial dentures were offered to Frank as a way to help solve or minimize all of these concerns. Several options were presented, and he chose partials that fit onto precision attachments that were added to crowns on his teeth and implants to stabilize the back teeth of the partial so that there was less movement during chewing. 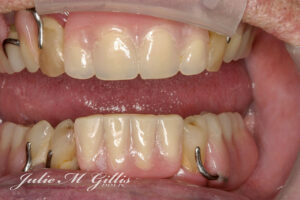 Notice that there aren’t any metal clasp arms holding the denture in place. Even though there were only three remaining teeth, the specialized attachments eliminated the need for metal clasps. In fact, the denture is now so stable we had to place small ‘lifter’ tabs on the lower partials to help the patient remove it! 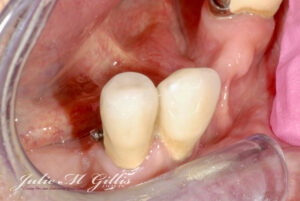 The photo below shows a single implant with a “locator” attachment (or abutment) that’s been placed in the lower jaw. The locator attaches to a specialized connection housed inside a partial denture. 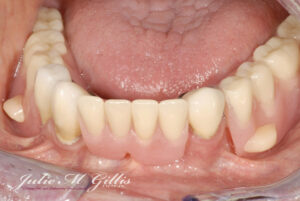 Using this mechanism, chewing becomes much more comfortable, as the partial does not constantly lift off of the gums. Like natural teeth roots, dental implants can stimulate bone tissue and preserve the remaining jawbone. In the next photo, you may notice how thin the bone has become in the area without teeth. If you are missing teeth and would like to hear more about the options we offer for replacing them, we would love to explain what dental implants could do for you! We encourage you to contact our office to schedule an appointment with Dr. Gillis to learn about dental implants. Sometimes, just adding one or two dental implants can make the difference between a partial denture that you love, and one that you dread to place every day. It is also very important to have a denture or partial denture that really fits your mouth, your bite, and your lifestyle. Our office works with talented technicians to help you receive the precise, customized fit that you deserve!